NEW BEGINNINGS-IT TAKES COURAGE TO CHANGE ©: ARE YOU PRODUCING GOOD FRUIT? What a wonderful day it is! I Hope that you have had a Spirit Filled, Joyous past few days. Remember, just because the actual day to Celebrate Jesus' birthday has past, doesn't mean The Miracles have ceased. Now that the excitement associated with preparing for Christmas Day has passed, you may be feeling let down, and back to the same old same old. If so, then you may not know and understand the full meaning of the Celebration of His precious birth, nor grasp the ‘all healing’ of God's Love for sending Jesus here for us. It is time for a simpler life. Making sure that you are firmly in the foundain that God gave us, and are consistantly seeking His Face and presence. Faith is what will get the people of God through the lean years that we are within. Getting through these lean times will take using all the Gifts of God's Spirit, and learning and using all the teachings of Jesus. Humbling oneself and letting go of what is no longer needed in your life, what is not working anymore, what you should not have bought or allowed in your life in the first place and then in the spaces that these items will leave behind, Jesus can stregth out and occupy more of you. Growing deeper and stronger into His purpose for your life. Amen. As people are gearing up to celebrate the New Year-this is a time when they make all these lists-goals and marks of completion for certain changes and growth that they want in their lives. Then they put different amounts of time-thoughts and decisions into doing everything on these lists, and pretty soon the desire to fulfill what they said they want falls to the wayside. It seems not many people put on their “I want a better me” list; #1-to Allow Jesus to Save them and becoming one of His Followers and a Worker for God. #2 allowing the spiritual growth to take place in order to strengthen their wisdom, knowledge and understanding of the purpose they were put here for. #3 allowing God to heal them from all wounds, pain, hurt, and sins. #4 Continuing all of the above and more, Everyday. A lot of people want to sit in church on Sundays, volunteering for so many committees, and donate some used clothes-and for them, this is enough to be dressed in good works and they feel that is all they really have to do to be a Christian. They may really love Jesus and God and really want to be right. But, they are only fooling themselves and God knows. And so do a few other people that know and understand what Good faith works and being fruitful are all about. There are many of God’s people that have a relationship with Jesus and are growing and producing good fruit. Being busy thinking you are helping people and checking off your list of good Christian works is not always being fruitful. The difference is great, between being busy and living a fruit producing life as Jesus said He chose us to be and do. This requires that we use everything that God has given us and continues to give us to be fruitful every day. We have The Gifts of the Spirit. Gal 5:22-23. I wonder how many lists these get put on. Making up your mind—making a decision to be fruitful will bring forth the beginning of many positive opportunities and changes. Making decisions of any kind, small large, simple, or complicated-they all mark the beginning of multiple changes. This is when some work, effort, courage, strength, wisdom, understanding and spending more time with God comes into position. Spending more time with God means to read and learn His Word, and spend time talking with Him. Telling Him what is on your mind and heart. When people’s decisions lead to specific changes that are not what they desired to have-they never seem to go back to the point of origin. Back to themselves and how their flawed motives lead to flawed decision creating flawed changes that lead to a more burdened life. Many of the people that fall into this mindset are Christians that don’t seem to be growing at all in their spiritual maturity. I know that we are all at different places of our learning and journeys, but I am speaking about Christians that are plain stopped-no forward, inner growth at all. They ‘got saved’ and stopped. Now they sound like Christians and they look like some—but they are not living by The Word. They can spout off any scripture from memory—you know those types? But their Walk with Jesus is not balanced by how they are living. 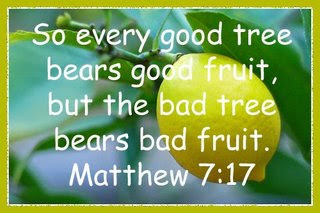 No good fruit is being produced. We are to live in order to take people with us. They may be making sure a few don’t get in by the way some Christians live. I come across so many people that speak out that they are ‘Saved’ by Jesus-and how much they love Him, and are not in relationship with Him. How can I tell? By The Fruit that they offer. Listen to them when they tell you about anything in their life. They have this sadness in their voices—almost like drudgery. If they start off listing their problems, then move on to the people that caused the problems, then the people through their life ‘that have done them wrong’, and the people they helped in the Name of Jesus and those people ‘done them wrong’. How their children will not act right and their life partner will not act right. How they think they look and what’s wrong with their looks or body, or how they hate their job or want a job, how they want a list of material things but don’t have the income to provide those ‘things’. They sit in church and gossip, they create false truths concerning those they are jealous of, and try to make divisions and problems where none exists. They go to church looking for a man or a woman but it’s not Jesus! Yes, they very well may have gone through the motions of being Saved but they are stuck at the beginning thinking, ‘getting saved’ was all they had to do to have the better life that Jesus teaches about. The same Good Life that they hear other Christians talk about. They also make a mistake of looking at other Believers and basing their knowledge of God on “how “ these other believers look and what they drive and where they live. Many people know how to dress themselves up in good deeds and attention getting clothes. But what lives in their hearts? Good fruit-or spoiled rotten fruit? When in fact, many of these other people may or may not be Christians, and nobody really knows how people get the material things they do. And that is not the point of relationship with Jesus in the first place. They do not realize that Jesus came here to Save us from our SIN—Not from our Problems. In Fact, He said that the world is full of troubles and hurt, and for us not to fear, nor lose hope-that He has already conquered this world. He came to heal the wounds, pains and hurts that live in each of our heart—not to heal your credit or your relationship with another person when you will not allow Him to heal and save you first. We always think it’s the other person huh. But you must have a relationship with Jesus to be moved toward and reap that Good Life that He teaches about. You have to be disciplined and use self-control in order to go to God with any and every dilemma you need to settle and ask Him what decision is best for you to make. Then you have to do what He tells you to do. Now, the changes will begin to happen and the desired outcome likely will be in much of what God does for you. Make a note-when you put things in God’s hands, and you leave them with Him- He Always Gets Good From It. Amen. Are you sensitive to God’s presence in your life? He silently teaches us-His children-those of us that answered ‘YES’. His silent teachings depend upon how we approach Him each day. He teaches us to allow Every discipline, every joy, every difficulty, every fresh interest to serve to draw us nearer to Him. Let it all serve to make us more sensitive, more spiritually mature, more spiritually aware of His presence. It is the beginning of being sensitive to Him that opens the door to the Joy He gives us. He wants us to realize that we are a tool in His hands—an instrument that He plays and with such-when we are surrendered to Him-sensitive to Him we allow Him to play the most sweetest harmony through us. We are changed by the decisions that we make. So many are they who refuse and fail to hear Him. They may think that God is far off away. He is always ever ready to speak to them, but they have missed the power of discipline, the wonder of communion with Him. When sitting and reflecting over your past year—let go of things that did not work. For whatever reasons they didn’t; don’t ponder too long, just let them go. If you are to pick certain projects up again, then Pray on it and allow God to guide you. Remember, we all go through the transitions from being led by our natural emotional self-to being led by our spiritual self. It is a transition that some people have a hard time passing through. There are a few phases and stages of the transition. He takes us through each part when He knows we are ready. You learn to Prove Him concerning different parts of your life when He brings it to your focus. Or you don’t and you end up going back around not letting go—not learning- not changing. If you like to drag things out-keep being stubborn. If you really are tired of yo-yo-ing between doing things yourself and thinking that God is doing them for you—then you will allow Him to teach you and you will begin to trust and have faith in Him more often without even thinking about it. People do not ask God what they should do when they don’t know what to do at the beginning of a thing. They come to HIm with the messed up results of the decision they made wanting Him to fix things. There are two forces that will ensure you daily (one day at a time) success from living faithfully. Work and Prayer. Our work and His work. For prayer I speak of a believing prayer. Prayers and Praises spoken with faith. Faith that knows He Can and He Will. This is based on the Certainty that Jesus is working for you, and with you, and in you. This is not about you trying to make something work one day and then when it does not—you hand it over to Jesus and when He gets it to a point you come back to take it over again—no, that will never work. I encourage you to go forward with gladness and joy; unafraid-Jesus is with you. Relying on other people your tasks will be impossible to complete, but with Jesus All Things Are Possible. You are not tired of the work, you may be tired from your work. REST in His faithfulness and His healing. Be re-stored, replenished, rejuvenated. Use the gifts of the Spirit and produce fruit from your faith work. Not just being busy doing faithless works with the wrong motives. I know a lot of people Love God—they just have their priorities messed up. They may be overly occupied and too busy—distracted from God’s Work because they are focused on their work, or their outer image, or any other emotional desire they allow to pull them away from spending time with God. They are not living with and in God’s purpose for them. It is conscious work to transition from walking an emotional ‘I feel’ life- to walking in the Spirit and being led by the Spirit. Changes have to take place—and we have to allow them to happen and look forward to all the glory they will bring for God through our lives. It is a choice-a decision that each of us has to make and then stick to it. To be ready to show His love with or without words for the believer and the non believer. This is being fruitful. You may not convince each person that you meet at first, but dropping a few seeds in them, watering the seeds they have or bringing them on in—which ever the case may be—we need to be prepared. We never know when God will send us a person we know, or a stranger to help. Living a life that is full of the Fruit of The Spirit. Have you ever thought about how God feels when so many people have troubled hearts and speak with deep anguish? His heart must ache with sadness when He witnesses such conditions that people’s lives are in. If God should behold the places, cities, towns, villages, countries, houses and homes and weep over them all because He sees such troubled hearts. Do you suppose He weeps because He is full of pity for them or that He may be weeping because these lives seek to live without His sustaining power? That He is thinking if they would only come to Me so that they may have life. His Work is our Work. Think on your past year and remember to let go of what did not work-and whatever you have that you are still in the middle of—give it over to God and let Him correct the plans and help you make the decisions that are best for you, your life and every one in and around your life. He wants you to be a blessing every time. If you make a New Year’s list this year, think about including Him and His work as First on your list of things that you need to change in your life. This is how to ensure that as soon as you put Him as number one in your life and KEEP Him Number one in your life—you will see and be changed right away. Remember, every decision that you make is the beginning of multiple changes. Are you including God to help you make the best decisions for the situation and for your life? You already know what happens when you go it alone. Whose lifestyle are you trying to live? Get your priorities in order. To Live in a lifestyle of giving, forgiving, helping, loving, and of faith. 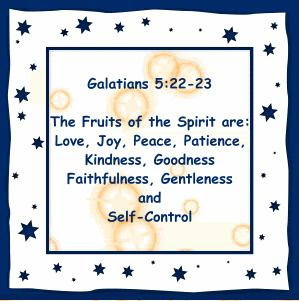 To walk in the Fruit of The Spirit, you must spend time with God-this keeps us balanced spiritually and in the natural.